2017 Finished out really well I have about a 4 month backlog to start 2018. I post most WIP stuff on my instagram @timostheos but I will post the better pictures here as well. I do have the following projects started but not claimed. These can be a had a bit sooner than the standard lead time. PM me if you have an interest. What do you think about 8670? 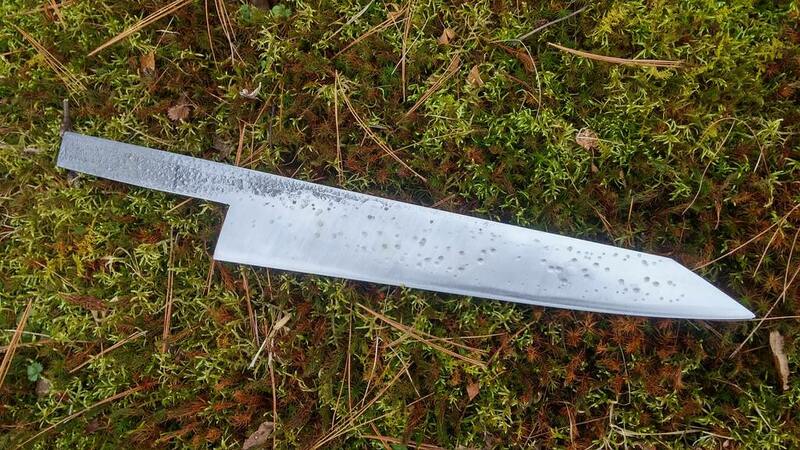 I made a Gyuto with some and it seems to do well, it doesn't stay razor sharp super long but it will really take a rediculously keen edge with all that toughness. I'm a fan of the nickel carbon steels in general for that reason. I really like it. I have one of Tim's K-Tips and it has the most amazing edge I've ever encountered. Yes needs to visit the stones more often..but it's so easy to get back. I like it, it is sturdy feeling, easy to maintain although needs maintenance more often. 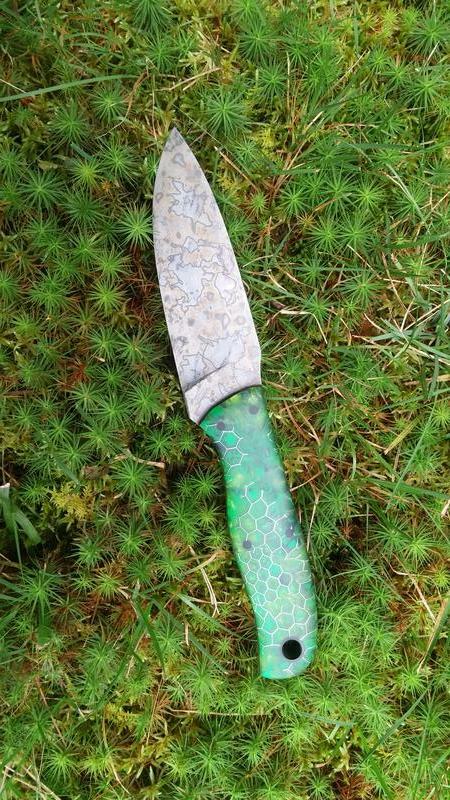 I chopped through a turkey neck in three different places with the 8670 pass around blade. Just very minor rolls and micro chip. took 10 minutes to sharpen out. I have a big 255mm blade in 15n20 I am trying next. Ray, I am really happy you are enjoying the blade! There's something pretty special about Tim's blades. He takes meticulous care with his tips and they're nimble enough to write your name on a needle. 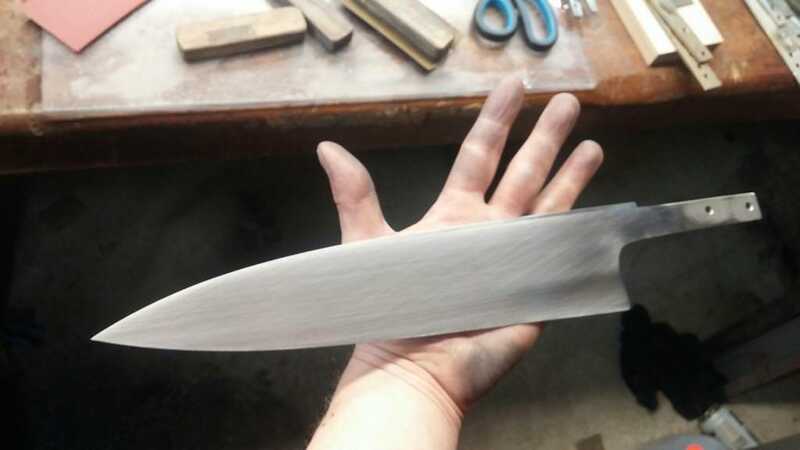 His edges.... or maybe it's the grinds... all knives need to be sharpened eventually... his cut great even when they need that sharpening. There's some magic in there. Heck. I've had one of his SV35n parers for about 9 months now. It gets used a couple of times a week. 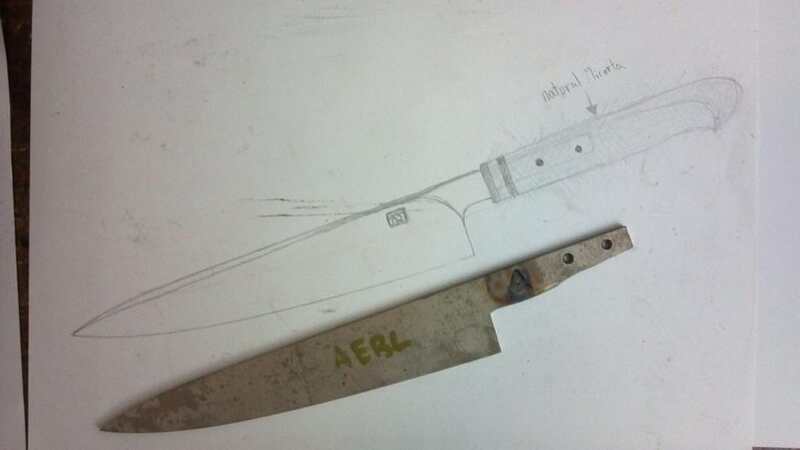 Sharpened once when I got it and that's all it's needed so far. ALRIGHT! That was a nice month of lazy weekends! Starting weekend of Jan 5th Ill be posting regular updates here. 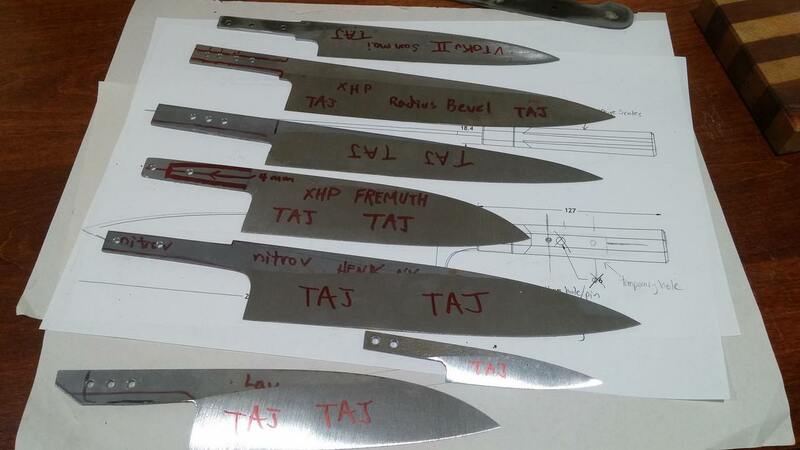 Just as an FYI I have the next batch of custom stainless blades to finish preparing for heat treat, then its a half dozen rehandles to finish by the end of the month, Once that happens I will be finishing custom orders one by one (about 1 knife a week). I have a handful of fun and exciting profiles ready to head to Peters Heat Treat. A couple 250mm gyutos, a couple different santokus, a 240mm suji, a v-toku II san mai "ghost cloud" petty and a wee little parer. You've really come into your own Tim. Just love your work! 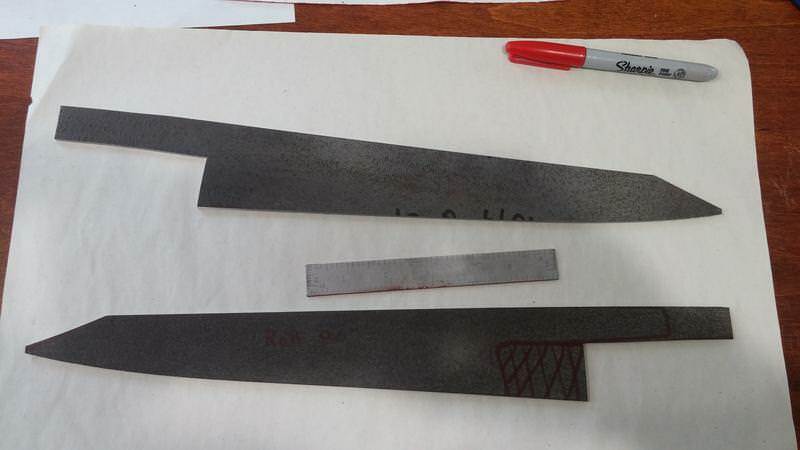 (photo below) carefully splitting the steel to yield a 270mm k tip and a 300mm k tip. 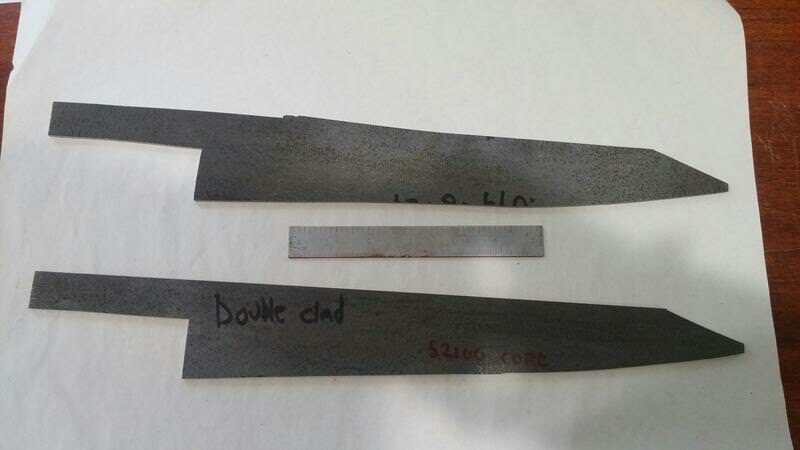 Both these blades are 52100 core stainless clad I will be applying my "ghost cloud" finish to. 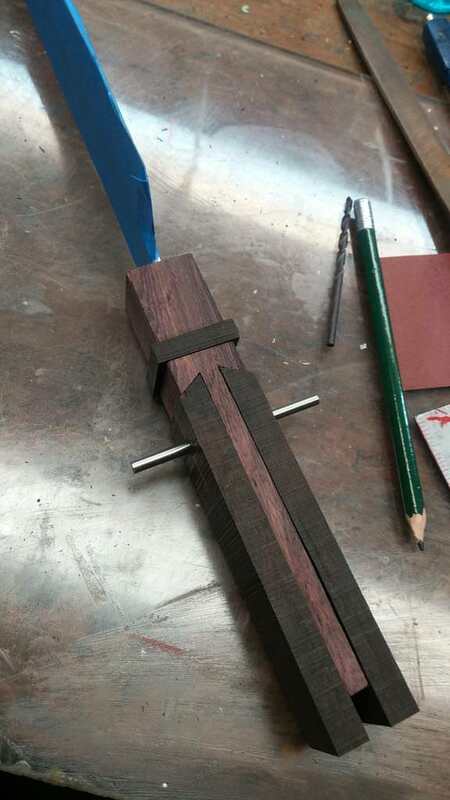 (photo below) Profiles are rough cut with a portaband. 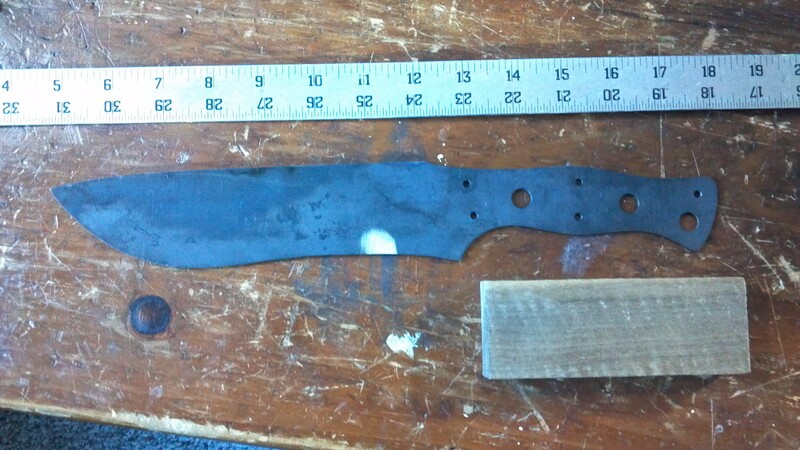 (photo below) Here we are after some shaping on the grinder. 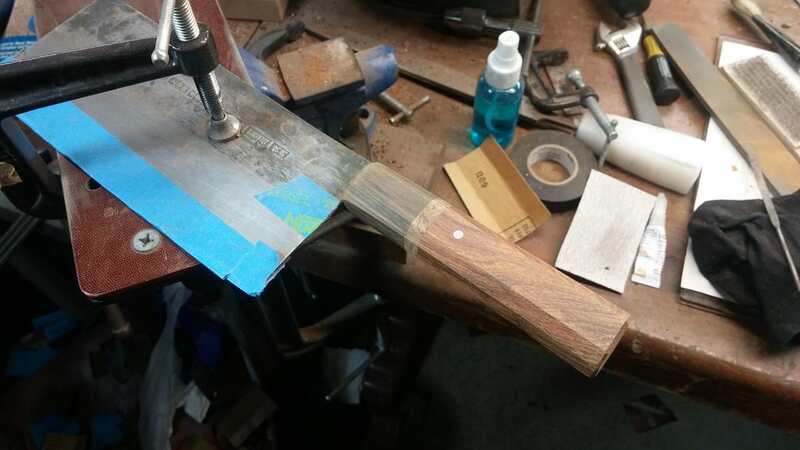 At this point I put the edge on a cutting board and kind of size it up, take some measurements, make sure its still according to plan, etc. (photo below) I went on a charter fishing trip last summer for striped bass, we got into them on the surface after a couple hours looking. There was 5 of us and we each kept one. All in the 35" to 45" range. 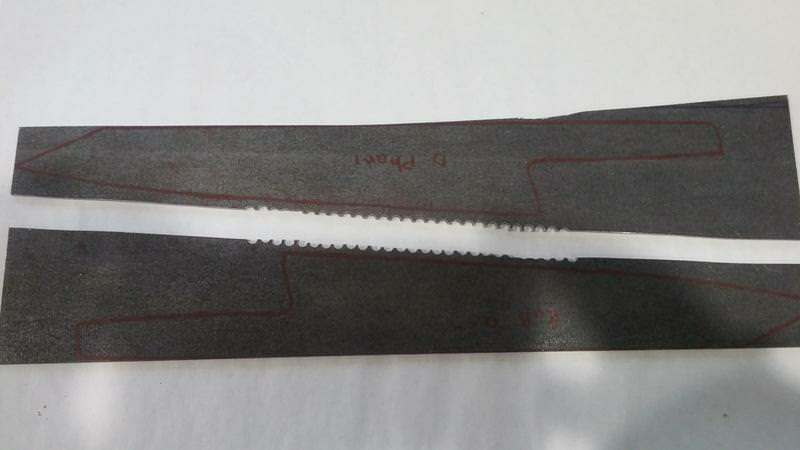 The captain used two knives to clean them. 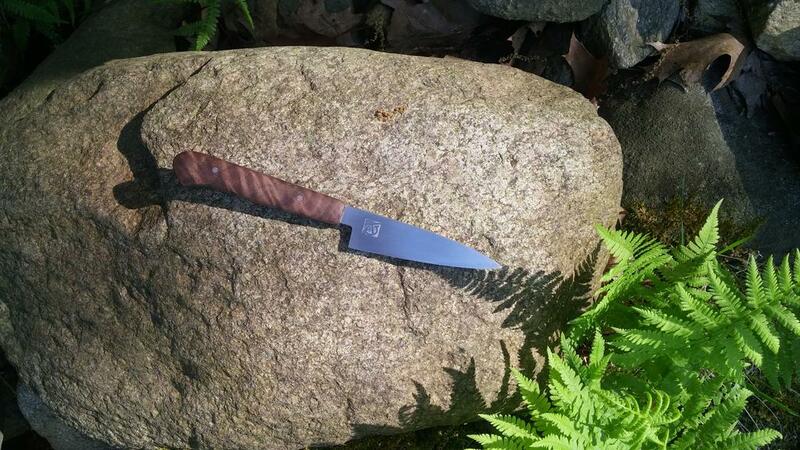 A large filet knife and a real small one. 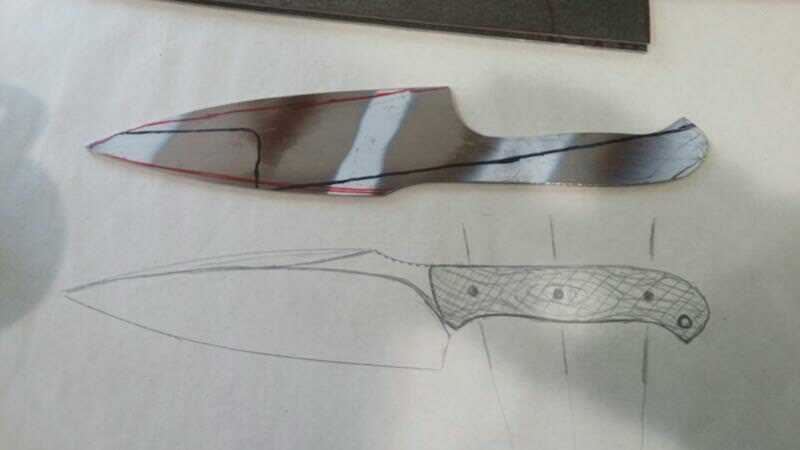 This knife was sort of born from combining the tasks of those two knives in to one, along with some discussion with mauichef about proper debas. 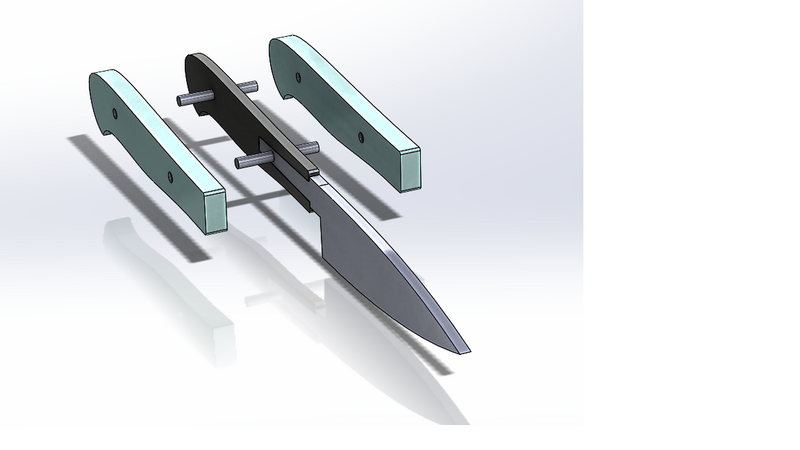 Here is prototype of "Captain's Boat Knife". 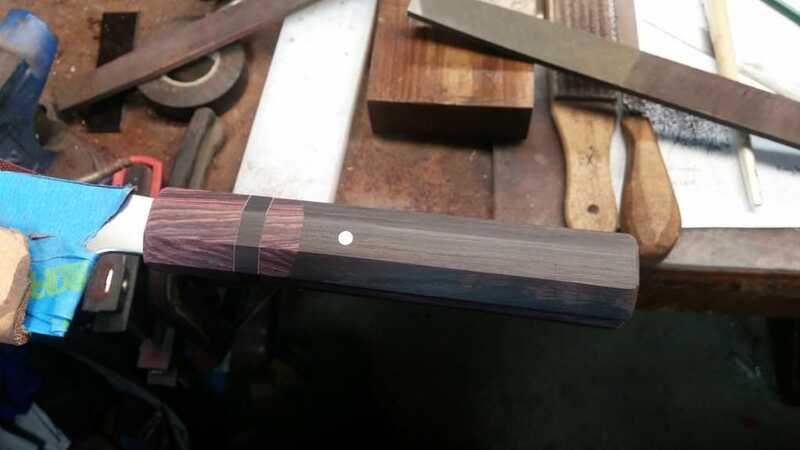 (photo below) both of these profiles in devin thomas raindrop 1095/nickel damascus. Damn dude! That is too sweet! Thanks Jeff! That handle is mounted to a Doi. Ill try and get a Finished pic later before the sun sets. 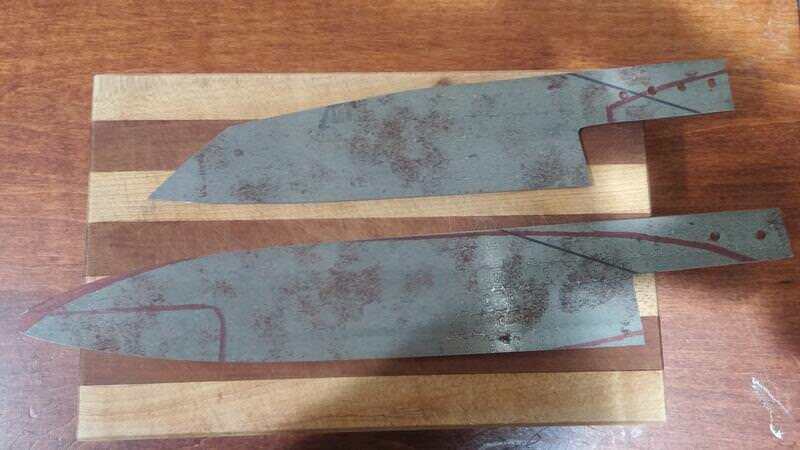 a 254mm by 54mm nitro v chef heat treated to rc63-64 by peters. This has a full distal taper of course. 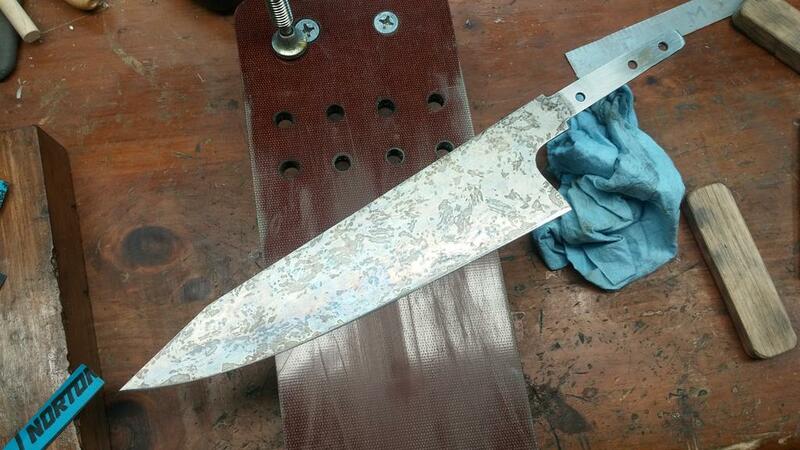 "ghost cloud" pattern in a v toku2 core s.s. clad petty. this one about 180mm. Damn Tim. That cloud is sweet! Yessir! I hope to see my custom on this page soon.